Let’s get some facts !!! That’s appalling !!! We have around 50% of our population dependent on agriculture and there’s a suicide being committed every 32 minutes !!! Our conscience is moved by this fact, and at TruTrade it is our life’s endeavour to do whatever we can to alleviate this problem. While TruTrade started its journey in 2012, TruTrade has it’s roots and emotional anchoring at EcoAgri initiative, which got started in 1994. We started to understand what we can do and how we can help the farmers. Over the next few months and years, we travelled the length and breadth of the country and we met with a lot of farmers, farmer groups, co-operative societies, researchers, academia, government officials, input companies, traders, food companies and retailers to understand the challenges faced by the farmers and what we can do to better the lives of the farmers. The responses on the challenges faced by the farmers were quite diverse, the responses ranged from using outdated practices, weather, infrastructure, access to technological and scientific research, lack of market linkages, fair prices, credit facilities, lack of proper irrigation facilities, post harvesting methods employed etc.. The list was quite exhaustive. We realized that the problems confronting the farmers were quite huge, and there is no way that we can solve all their problems, that would be like boiling the ocean. So we chose providing “market linkages” and providing “fair prices” as a key focus areas for us. Choosing market linkages and fair prices as key focus areas was easier said than done. The top leadership team at TruTrade worked at various multi-national-corporations before they chose to quit their lucrative paying jobs and do something for the bottom of the pyramid society, so the key question confronting the leadership team was – how can you not be seen as yet another “broker” by the farmers and consumers. We didn’t have the answer, but we firmed up our resolve to find something unique and innovative. Over the next few months we ideated on our intent and discussed ways and means to provide market linkages to the farmers and also fair prices to the farmers. We were/are not geniuses, the ideas/solutions did not come to us instantly, but we kept working on the problems, and slowly the solutions/answers/themes started emerging. We narrowed down on “Transparency”, “Traceability” and “Sustainability” as the key facets/aspects/values for our vision/model. (As of Nov 2016, we’ve added “Livelihoods” into our model). Thus started the journey of TruTrade. We established TruTrade in June 2015 as a not-for-profit social enterprise that works for the financial independence of the small and marginalized farmers. The question of how we are not seen as yet another middle-men was solved with the idea of the Transparent pricing mechanism. In the Transparent pricing mechanism we print on the back of the pouch all the costs incurred in the value-chain. This ensures transparency into the various costs. The cost buckets are categorized into : i) Farmer purchase price ii) Transportation costs iii) Processing charges iv) Packaging and Labelling v) TruTrade salary and admin costs vi) Dealer costs vii) TruTrade profit (zero) viii) Tax ix) Cost to consumer (MRP). A sample product with filled in TruTrade organic product is attached here in this link. For a lack of better word we call this as TruTrade transparent pricing mechanism. Having implemented the transparent pricing mechanism, it solved one of our biggest issues !!! To put the nail-in-the-coffin we thought it would be great to have a mechanism wherein the consumer will also get to know name of the farmer, the organic practices that the farmer is adopting, the village, taluk, district details and contact details like phone number if available, this would just make it pretty easy for all of us to validate the end to end traceability, and coupled with transparency this would be truly revolutionary. 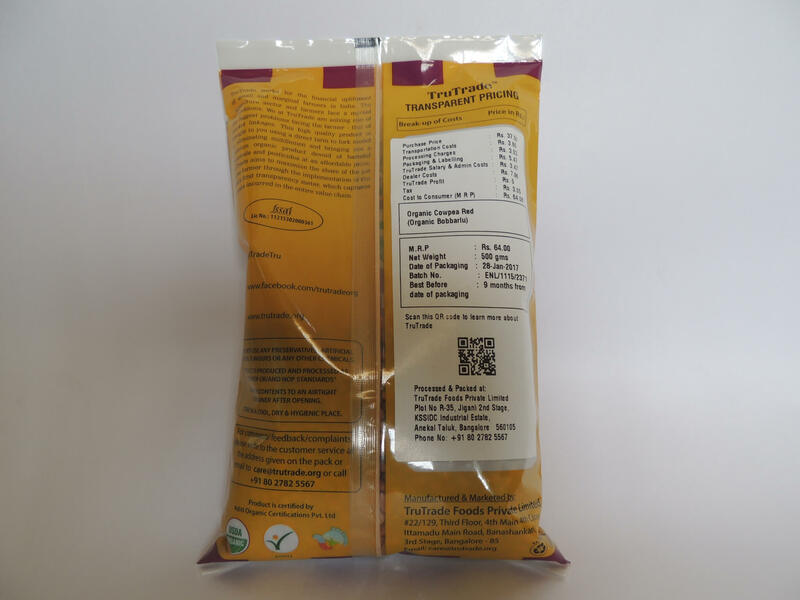 Technology came to our rescue and we thought that we could embed the QR code on our pouches and on scanning the QR codes from a mobile phone a customer would get to know the traceability. To see the QR code implementation on the pouch, please click on this link. For now, if you scan the QR code it will currently take you to a generic YouTube video. The implementation is easier said than done, there are quite a few issues that need to be resolved, we are listing one scenario: i) quite a few times we procure from more than one farmers and club the purchases and transport it together, so how do we ensure that during the transportation the produce of the farmers does not get mingled. Be rest assured this is something that is on the top of our organizational priorities and we will get this resolved. After we introduced TruTrade products in 50 of Greenz outlets in Hyderabad, we were exploring options of how we can replicate the store model in other cities. To establish 50 stores in one city is capital intensive and for a not-for-profit social organization social capital is scarce. So when we were thinking of replicating the model for Bengaluru and Chennai, we challenged ourselves on finding out a better way to do things that is financially inclusive. That’s when the idea of Organic Thelawala was born. Organic Thelawala leverages micro-entrepreneurs and rather than pay 35%-40% margins to modern retail outlets and super markets we thought it would be better if we pass on those benefits to a Thelawala (push-cart vendor). This we thought was a win-win situation for everyone. We now have taken livelihoods as a goal within our organization as a key focus area. For more on the Organic Thelawala initiative please read our blog here : https://www.linkedin.com/pulse/empowering-thelawalas-naveen-seri/. And that’s what TruTrade stands for – Transparency, Traceability, Sustainability and Livelihoods !!! These facts/aspects/values are not to be confused with what we do for the farmers and the agriculture value-chain. You can read more about what we do for the farmers and agriculture value chain in the “What We Do” page.